Nassau Re's headquarters at One American Row in Hartford is known locally as the Boat Building. It is a monument to the company’s commitment to the community and a visible reminder of our innovative approach to business. Completed in 1963, the building is an exceptional example of the Modernist architectural style. It was listed on the National Register of Historic Places in 2005. The Boat Building was hailed as the world’s first two-sided office building when it opened. Its 13-story tower is an elliptic lenticular cylinder. Harrison & Abramovitz, a prominent architectural firm known for New York’s United Nations headquarters and Lincoln Center, designed the building. The George A. Fuller Company, whose founder invented the modern skyscraper, constructed the building. This "cutting edge" concept from a half century ago remains stunningly contemporary and a distinctive presence on the Hartford skyline. Construction of the Boat Building cemented Phoenix's commitment to the renewal of Hartford, where the company was founded in 1851. It also reflected the company's forward-thinking and innovative business approach. The Boat Building played a pivotal role in the early 1960s urban renewal movement. The company's decision to remain in Hartford assured the development of the adjacent Constitution Plaza complex. Constitution Plaza was the first urban renewal project in Connecticut and one of the earliest in the nation. See photo gallery. From its ground breaking in 1961, state and national newspapers reported on every step of the design and construction process. In 1964, the first year of operation, 12,000 visitors toured the facility. 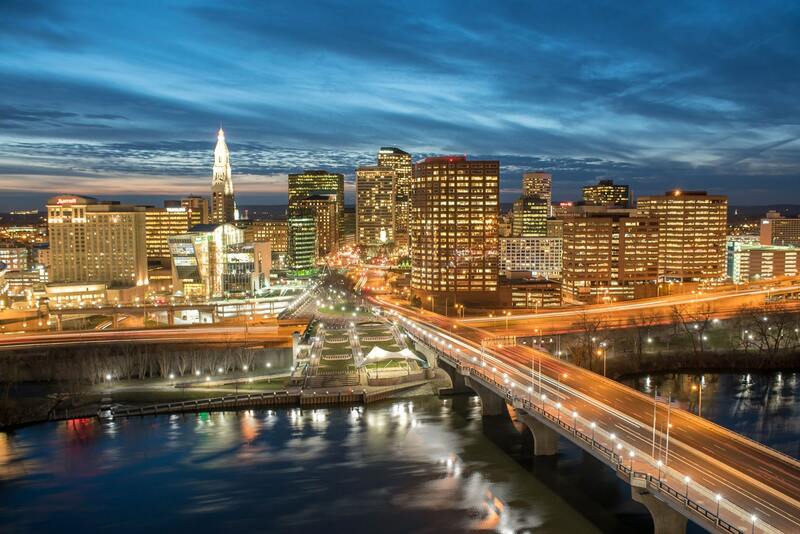 ... this striking building will add greatly to the fame and well being of the City of Hartford. Greater Hartford Chamber of Commerce February 14, 1961. Once the decision was made to go against the tide of urban exodus, the company’s president took it a step further. The bold and unconventional architecture of the new headquarters was going to make a statement about the company’s growing track record of innovation. At the same time, it would create a stark contrast with insurance carriers' then-conservative image. According to company legend, when the architects unveiled the scale model for the company’s board, there was stunned silence. When the design was presented to employees, everyone stood up and clapped the moment the artist’s rendering flashed on the screen. The Boat Building brought the company unprecedented attention and permanently changed the company’s reputation. Now serving as the headquarters for Nassau Re, and home to several tenants, the Boat Building continues to inspire new ideas. 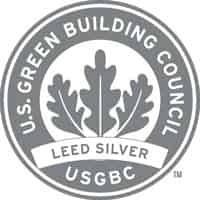 In 2010, the Boat Building was awarded Silver Leed® (Leadership in Energy and Environmental Design) certification from the U.S. Green Building Council for optimizing energy efficiency and adopting a green cleaning program. It is one of a small number of buildings that are both Leed® certified and listed on the National Register of Historic Places. In 2013, the plaza surrounding the building was renovated with environmentally friendly planted areas. This green renovation was the first completed private property piece of Hartford's iQuilt Plan. This initiative promotes creative urban design to strengthen pedestrian links between downtown destinations. The plaza also serves as a green roof for the open quadrangle that forms the base for the Boat Building tower. Prime office space is now available for lease in the Boat Building, located in Hartford's central business district. The design creates approximately 13,000 GSF per tower floor with the ability to divide or combine floors. This landmark building provides a truly unique location to meet your business office needs.